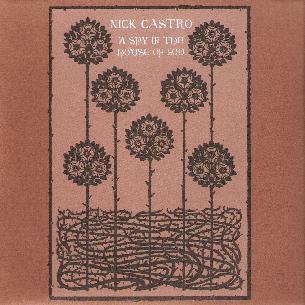 Nick Castro - "A Spy In The House Of God"
Nick is a solo artist and this is his debut solo CD. As I did not receive much info with the CD, I am assuming that Nick plays all the instruments, which includes bells, guitars, keyboards, and flute "The Jack of all Seasons" opens the CD and features some beautiful guitar playing and maintains a bit of a Pink Floyd feeling. "No Sweeter Thing" begins with some organ and guitars and has a real Asian feel to it somehow. This is some really great slightly psychedelic folk music. "Winter's Chill" features some simple but nice flute playing to accompany the acoustic guitar. "Flight of the Morning Dove" continues and reminds me of Pierre Bensusan. "Zoey" is a very strange psychedelic freakout number! This is followed by "If Your Soul Could Sing", which starts with some hand drums and a very middle eastern style guitar and then the only electric guitar on the CD kicks in and disappears as someone walks across the room and voices repeat themselves over and over (female). Then Nick begins to sing and play acoustic guitar and is accompanied by a female vocalist. "This Was That And Then", begins with flute and goes into another Indian inspired guitar piece. "Dear Stranger" has a guitar part that reminds me of "Out On The Western Plains" by Rory Gallagher. "The Opposite Of It" is a short strange piece of music that leads into the closing number, "Ordinary Life". "Ordinary Life", closes the CD as a nice acoustic love ballad. This is some really great slightly psychedelic folk music with an experimental edge to it. While I don't think Nick is a brilliant vocalist, I have really enjoyed this CD a lot and we have heard it many times in the house now! I highly recommend that you check out the great interview with Nick at the following link! http://www.foxydigitalis.com/foxyd/castro1.html. Fans of the Finnish band Octopus Syng will enjoy this CD quite a lot. For more information you can visit the Nick Castro web site at: http://www.spyinthehouse.com.